HAMMER FIGHT, those whiskey-drinkin', beer guzzlin' bros who spawned from New Jersey, released their Napalm Records debut, Profound And Profane, on March 25th. The band’s new video for the track “Good Times In Dark Ages” can be seen now on KNAC.COM right HERE. HAMMER FIGHT brings a sound that many kids these days may have missed; hard rockin' metal. 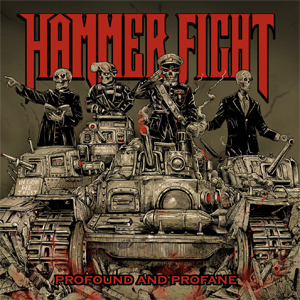 Versatile enough to share the stage with the most extreme death metal acts to classic hard rock bands and everything in between, HAMMER FIGHT are ready to make an impression on the today's heavy music scene.